- Separate procurement from multiple suppliers can make management complicated and time-consuming, and it can also increase the total cost. - We can't formulate a sales plan because we are unable to predict the timing of delivery of products from the suppliers. - Products supplied from overseas are temporarily stored in a domestic warehouse. This may lead to excess inventory in some cases in which we are concerned about the cost to be high. You can reduce shipping cost by consolidating products from different suppliers for shipping. Through buyer-led logistics, you can control the delivery date and capture sales opportunities. Through just-in-time delivery and direct shipping to stores, you can reduce quantity of domestic inventory in Japan. 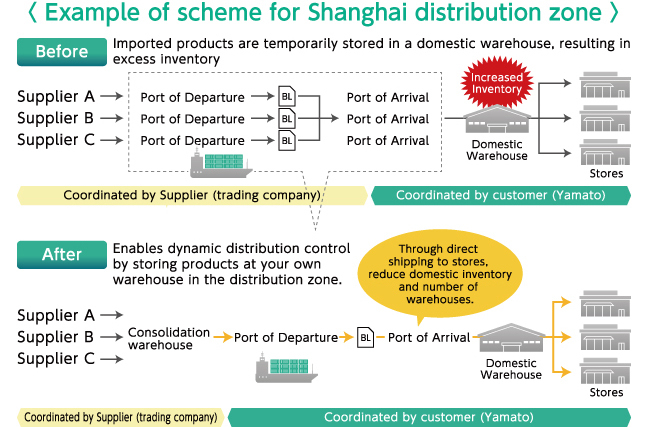 Products procured from multiple suppliers and trading companies are grouped at Yamato's overseas consolidation warehouse before shipping. This realizes an efficient shipping scheme at a reasonable cost! -Products can be consolidated on your company's name in the China bonded logistics park. Loading products from different suppliers into the same container, it will realize a significant reduction in import cost (customs fees, handling fees, etc.) related to each shipment. -The process of sorting, assorting, and inspection that is currently performed in Japan can be executed overseas, where personnel expenses are low, resulting in reduced labor cost. Instead of entrusting logistics to the supplier performing procurement at the buyer's desired timing, it is efficient to capture sales opportunities. You can realize distribution with quick delivery in expected time! ■It is possible to arrange transportation, fitting for high-frequency and small-lot shipment according to merchandise turnover. It leads to a reduction in excess inventory and domestic warehouses. Through transportation to the bonded logistics park, products are handled as exports and applicable for refund of value added tax. It promotes improvement of your cash flow. Use GL-Cat to select the required products while viewing the receipt status of overseas warehouses on the web. This enables direct issuance of collection orders at anytime, from anywhere and by anyone!